Many families think of Waikiki and decide they don’t want to stay in a busy city. They imagine crowds, waits at restaurants and high rises. Waikiki absolutely has some of this, but it also is home to the Hilton Hawaiian Village, a wonderful resort perfect for families. My family recently spent three nights at the Hilton Hawaiian village. Our stay happened to fall over the busy Easter weekend. The Hilton Hawaiian Village is located on 22 acres of oceanfront. It’s away from most of the hustle and bustle of Kalakaua ave but still close enough to enjoy Waikiki if you wish. The Hilton Hawaiian Village consists of five hotel room towers and two Hilton Vacation Club towers with condo style accommodations. We stayed in the Kalia Tower in a city view room. Our room had the usual hotel room amenities. It included two double beds, a flat screen tv, a balcony and a mini fridge. Our tower had a fourth-floor rooftop pool with hot tub and a gym. The Hilton Hawaiian Village is large but very well laid out. It doesn’t take too long to orient yourself and find a favourite pool. I recommend familiarizing yourself when you first arrive, check out the pools and decide where you want to spend most of your time. The property has 5 pools available to all Hilton guests, no matter what tower you are staying in. My kids really enjoyed the paradise pool. This pool has a leveled entry and three water slides. It also has two family hot tubs. The Hilton Hawaiian Village also has it’s very own lagoon. The Duke Kahanamoku Lagoon is located next to the Rainbow Tower. The Duke Kahanamoku Lagoon is a 5-acre saltwater lagoon with a state-of-the-art water circulation system. My family especially liked the sandy beach and all the rentals available at the lagoon. While we were at the lagoon we rented two long chairs and umbrella, a pedal boat and an aqua bike. My kids went nuts with the aqua bike and could have stayed on it all day. I really enjoyed how safe the lagoon was. The deepest part of the Duke Kahanamoku Lagoon is only 5 feet. Another notable thing about the Hilton Hawaiian Village is its access to restaurants. There are so many dining options right outside your door. My family enjoyed dinner and breakfast at Tropics Bar and Grill. For breakfast, I had the most amazing Luau Eggs Benedict. I have never had such amazing eggs benny in my life! For dinner, my husband and I had the Tropics Burger and Seafood Pasta. My kids had Spaghetti with Meatballs and loved it. I really love the location of this restaurant. In the evening they have live music. Other dining options at The Hilton Hawaiian Village include a Japanese restaurant, a steak and seafood restaurant, an Italian restaurant and even Lappert’s Hawaii – home of the most amazing gourmet ice cream you’ve ever tasted! Overall my family really enjoyed our stay at the Hilton Hawaiian Village. I felt safe at the resort, I didn’t worry if my kids ventured off in the pool or the lagoon without me. The hotel has so much to offer and we are pleased that we had the opportunity to experience it first hand. I probably wouldn’t choose to visit Waikiki on Easter weekend again. I think that Waikiki and the Hilton Hawaiian Village would be much more relaxing at other times of the year. The Hilton Hawaiian Village is the only resort of it’s kind in Waikiki. It is a wonderful place for families, it has top-notch amenities, several lodging options and is clean and safe. 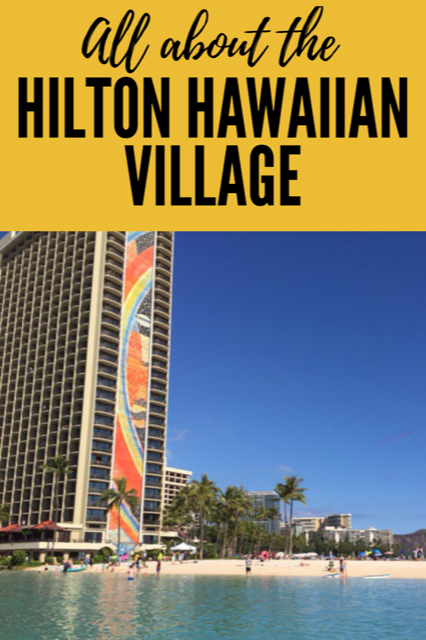 If you’re looking for a family resort in the Waikiki area the Hilton Hawaiian Village is a great option. To learn more about the Hilton Hawaiian Village you can check out their website. You can also follow them on Facebook and Twitter for up to date information, fabulous photos of the property and special promotions. Disclosure: The Hilton Hawaiian Village provided complimentary activities for my family while on the property. No other compensation was provided. Opinions expressed in this post are my own. Looks wonderful! Makes me want to go there, that’s for sure! Very fun family destination. Looks amazing! I would love to go one day! sure looks like a nice holiday. We love the quiet of Maui ourselves. This sounds like a wonderful place! Can you tell me if the Lagoon is completely separate, or fenced off from the ocean? I know it is stupid but I can’t help worrying about sharks! Wow, what a perfect place! Thanks for the post with pic’s, will be adding this one to my list of places to stay! ok that aqua bike is the coolest thing ever! looks like a great place for a family vacay! I am glad you had an amazing time. The resort is beautiful. Wow you must have enjoyed a lovely vacation.I would love to stay at the Hilton Hawaiian Village. Oh my goodness, what a great trip! My kids are too little to go into the ocean at most beaches, we must visit that lagoon! Oh looks like sure a great place to visit. I am trying to convince Hubs that we need to go on a family vacation. This year we might stay closer to home, but next year… I want to go away! OH MY GOSH that looks like so much fun! I have yet to make it to Hawaii! That’s on my bucket list. I will pin this so I remember the name of the resort/hotel. It looks like there’s a lot to do for kids too. My girls would love that floating bike thing. This looks like a dream destination! I would love to stay at the Hilton Hawaiian Village. Please take me next time! I really need to go on a vacation! Looks like a wonderful family trip you will look back on for many years with fond memories.